The Ekco PB189 is perhaps one of the most sought after motor-tuned sets, although certainly not the rarest. Other manufacturers also produced motor-tuned sets, for example Defiant, Murphy and McMichael. However the PB189 is a classic of its type, being a relatively simple design but capable of being maintained to give effective service even 60 years later. Unlike some receivers, this set does not support “cruising”, whereby a finger could be held on the button to listen to stations as they were passed by. The PB189 merely moves the scale pointer to the station defined on the push button, but unlike other pushbutton sets, the variable tuning capacitor is also physically moved to the appropriate position, rather than an adjustable preset per button utilised in the majority of pushbutton sets. The set was released in 1938 and cost £13 2s 6d and featured 6 valves plus rectifier. Valve line-up is TH4A, T41, VP41, 2D41, DT41, OP42, R41. Note that these valve designations relate to Ekco’s own valve brand, as by this time Ekco were making their own valves. The Ekco valves are direct equivalents to other valves also on the market at the time, for instance the OP42 could be directly substituted for Mullard PENA4. 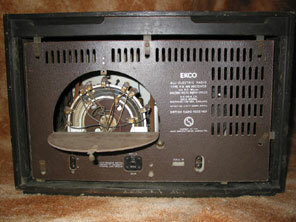 In reality many receivers were shipped with Mullard valves rather than Ekco anyway, although the receiver pictured retains a selection of original Ekco valves. Ekco own brand valves are easily recognisable by virtue of the fact that the metallising is sprayed silver. The chassis is housed in a fairly substantial cabinet measuring L 22”, H 12”, D 10”. Ten pushbutton stations are available, eight on the MW band and two on LW, all selectable by a vertical row of brown pushbuttons to the right side of the cabinet. A white pushbutton is also provided, and this will disable the motor tuning and allow the set to be tuned manually with the large knob directly beneath the tuning scale. The owner if necessary can change the pushbutton stations, and this is accomplished by opening a semi-circular flap on the back cover on the set (picture above right). Note it is not necessary to remove the entire back cover and hence expose the user to high voltages, though it must be said it would be easy to touch a part of the chassis and get a shock, hence the opening slot in the cover perhaps gives a false sense of safety. I’ve a suspicion most people would remove the entire back cover anyway, as fiddling about with thumbscrews etc through the flap in not easy. It is possible for the owner to change a pushbutton setting himself without recourse to a dealer. 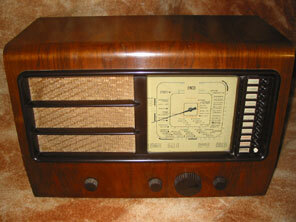 Altering a station selection is accomplished by first pressing the white button, and then manually tuning the receiver to the desired station. The user then depresses both the white button and the chosen brown pushbutton , at which point a small lamp at the rear of the chassis glows. The appropriate clip for the selected pushbutton is then slackened and moved along the semicircular rails at the rear of the receiver until the lamp extinguishes. There are two semi-circular rails running parallel to each other, in the event that two stations very close to each other need to be set. In this case one station would be set on the lower bar and the other on the upper bar.